Akani Simbine was unstoppable in 2017. Photo: Karim Jaafar/AFP. It’s a career-defining night for South Africa’s 100m kingpin in the first IAAF Diamond League meet of 2017 as Caster Semenya shines too. 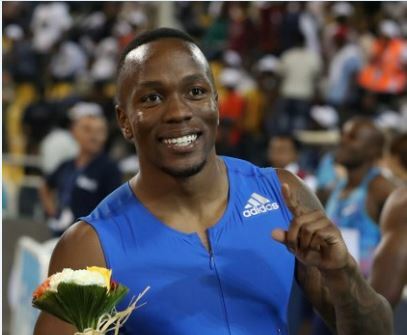 Sprinter Akani Simbine enjoyed a career-defining moment on Friday night, storming to victory against a world-class field in the men’s 100m race at the opening leg of the Diamond League series in Doha. Possessing one of the fastest starts on the international circuit, Simbine wobbled slightly out the blocks but recovered quickly and charged clear to win comfortably in 9.99 seconds. Dipping under 10 seconds for the sixth time this season, he took some big scalps in the process, defeating former world champion Justin Gatlin of the United States, Olympic bronze medallist Andre de Grasse of Canada and previous world record holder Asafa Powell of Jamaica. Powell was the best of the rest, crossing the line in 10.08 for second place. Earlier, Caster Semenya had also opened her international campaign in style, coasting to victory in the women’s 800m race to extend her lengthy winning streak. After sitting back on the first lap, Semenya hit the front with 200m to go and held off a lone challenge down the home straight from Kenyan athlete Margaret Wambui. The Olympic champion set a meeting record of 1:56.61, finishing 0.42 ahead of Wambui. An expected challenge from Ethiopian Genzebe Dibaba, the 1 500m world record holder, did not materialise as she faded in the latter stages to settle for fifth spot in 1:59.37. LJ van Zyl and Cornel Fredericks also produced solid performances in the men’s 400m hurdles race, though they were well of the pace of in-form Qatari athlete Abderrahaman Samba. With Samba finishing nearly a full second clear of the rest of the field in 48.44, Van Zyl managed to grab third spot from lane eight, completing the race in 49.49. Fredericks, who was sidelined from the national championships in Potchefstroom last month with a hamstring niggle, made a return to the track by finishing fifth in 49.99.